Jurors deliberated for seven hours over two days before reaching the mixed verdict Friday in the case against Paul Woodlyn III, The Philadelphia Inquirer reported. Two parents say justice was not served after a jury reached a mixed verdict for the driver who killed their daughter in a hit-and-run in Overbrook last year. NBC10's Aundrea Cline-Thomas speaks to the parents. The parents of an 8-year-old girl who was struck and killed in a hit-and-run a year ago are outraged after the jury reached a mixed verdict for the man responsible for their daughter's death. "No proms, no graduation," Ayeshia Poole said. "I get no grandkids. I don't see my baby walk down the aisle. I don't get none of that. But he can still see his son." 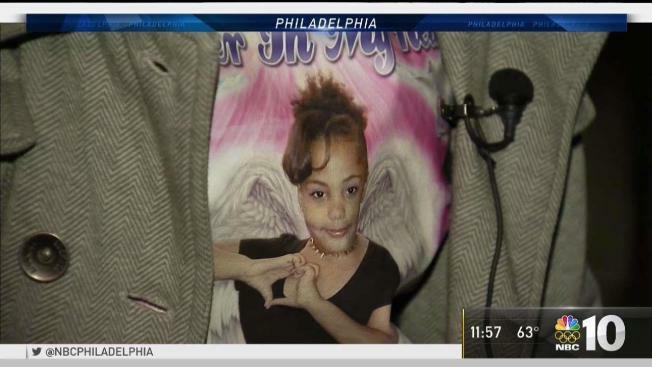 Poole's daughter Jayanna Powell was walking home from school with her siblings in November, 2016 when she was struck crossing an intersection at 63rd Street and Lansdowne Avenue in Philly's Overbrook neighborhood. The car also knocked her 12-year-old brother to the ground. Investigators identified the driver of the vehicle as Paul Woodlyn III. Authorities matched fragments from the crash to Woodlyn's car at a suburban auto body shop. He pleaded guilty at the start of his trial Tuesday to a felony charge of leaving the scene of a fatal accident. Paul Woodlyn (inset) is charged in the hit-and-run death of Jayanna Powell. On Friday, Woodlyn was acquitted of vehicular homicide but convicted of manslaughter and reckless endangerment. Jurors deliberated for seven hours over two days before reaching the mixed verdict. Woodlyn is scheduled to be sentenced on Jan. 19. Jayanna's parents told NBC10 they're not satisfied with the decision. "It's not justice to me," Jayanna's father James Powell said. "My daughter's gone. I'll never get to see my daughter ever again." During the trial, Poole and Powell sat through the agonizing court proceedings and testimony that recounted the painful details surrounding their daughter's death. "Looking at the car, looking at how my daughter's body was into that car, it was a lot," Powell said. Woodlyn, 25, testified Wednesday that the car in front of him in the right lane was stopped, so he drove around the car and went through the intersection in the left lane. This 8-year-old, Jayanna, was killed after being run over by a driver who fled the scene on Friday afternoon. The girl's brother was also hit. "I didn't see the kids," he said. Once he saw them, he couldn't avoid them, and he hit the brakes "but it was too late." "I just closed my eyes," he said. "After the impact, I just panicked and I left. ... I didn't deliberately hit anyone." Assistant District Attorney Erica Rebstock said Woodlyn wasn't charged with deliberately hitting someone but with driving recklessly and speeding, causing the second-grader's death. Woodlyn's car hit Jayanna with such force that part of its front grill fell off, and the child was thrown 100 feet away, Rebstock said. Jayanna and her brother "shouldn't have been mowed down by this man driving like a maniac," she told jurors. Defense attorney Benjamin Cooper called the child's death "an accident." "He left the scene, we all know that," Cooper said. "That's not cool at all. The question here is whether or not he committed a homicide." For Powell and Poole, the end of the trial hasn't brought them the closure they wanted. "I just want him to feel that pain that I feel," Poole said. "Just know that you took someone special away. You didn't give her a chance to live."